Musical instrument repairers and tuners work on a variety of instruments, often operating inside music shops or repair shops to keep the pieces in tune and in proper condition. Those who specialize in working on pianos or pipe organs may travel to the instrument’s location to work. Instrument repairers and tuners usually specialize in certain families of musical instruments, such as stringed or brass instruments. Depending on the instrument, they may be skilled in work­ing with wood, metal, electronics, or other materials. There are approximately 6,000 music instrument repairers and tuners employed in the United States. The world’s first musical instrument was the human body. Paleolithic dancers clapped, stamped, chanted, and slapped their bodies to mark rhythm. Gourd rattles, bone whistles, scrapers, hollow branch, and conch shell trumpets, wooden rhythm pounders and knockers, and bullroarers followed. By the early Neolithic times, people had developed drums that produced two or more pitches and pottery and cane flutes that gave several notes. The musical bow, a primitive stringed instrument and fore­runner of the jaw harp, preceded the bow-shaped harp (about 3000 b.c.) and the long-necked lute (about 2000 b.c.). The history of the pipe organ stretches back to the third century b.c., when the Egyptians developed an organ that used water power to produce a stream of air. A few centuries later, organs appeared in Byzantium that used bellows (a device that draws air in and then expels it with great force) to send air through the organ pipes. From that time until about 1500 a.d. all the features of the modern pipe organ were developed. The first version of the violin, played by scraping a taut bow across several stretched strings, appeared in Europe around 1510. The end of the 16th century saw the development of the violin as it is known today. Over the next 100 years, violin making reached its greatest achievements in the area around Cremona, Italy, where families of master craftsmen, such as the Stradivaris, the Guarneris, and the Amatis, set a standard for quality that never has been surpassed. Today, their violins are coveted by players around the world for their tonal quality. The modern piano is the end product of a gradual evolution from plucked string instruments, such as the harp, to instruments employ­ing hammers of one kind or another to produce notes by striking the strings. By the late 1700s, the immediate ancestor of the modern piano had been developed. Improvements and modifications (most involving new materials or manufacturing processes) took place through­out the 19th century, resulting in today’s piano. In addition to the stringed instruments, contemporary orchestral instruments also include the woodwind, brass, and percussion families. Woodwinds include the flute, clarinet, oboe, bassoon, and saxophone. Brass instruments include the French horn, trumpet, cornet, trombone, and tuba. 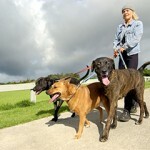 All require some pro­fessional care and maintenance at some time. The modern elec­tronic organ is a descendent of the pipe organ. In 1934, Laurens Hammond, an American inven­tor, patented the first practical electronic organ, an instrument that imitates the sound of the pipe organ but requires much less space and is more economical and practical to own and operate. The development of electronic and computer technology produced the first synthesizers and synthesized instruments, which are used widely today. Stringed-instrument repairers perform extremely detailed and difficult work. The repair of violins, violas, and cellos might be considered the finest woodworking done in the world today. Because their sound quality is so beautiful, some older, rarer violins are worth mil­lions of dollars, and musicians will sometimes fly halfway around the world to have rare instruments repaired by master restorers. In many ways, the work of these master craftspeople may be compared to the restoration of fine art masterpieces. The repairer does not complete every step imme­diately after the previous one. Depending on the age and value of the instrument, a repair job can take three weeks or longer. Glues and varnishes need to set, and highly detailed work demands much concentration. The repairer also needs to do research to isolate the original type of varnish on the instrument and match it precisely with modern materials. The repairer usually has more than one repair job going at any one time. A major restoration, such as the replacement of old patchwork or the fitting of inside patches to support the instrument, requires even more time. A large project can take two years or longer. A master restorer can put 2,000 or more hours into the repair of a valuable violin that has nothing more than a few cracks in its finish. Since many fine instruments are worth $2 million or more, they need intense work to preserve the superior quality of their sound. The repairer cannot rush the work, must concen­trate on every detail, and complete the repair properly or risk other problems later on. While all instruments are not made by Stradivari, they still need to be kept in good condition to be played well. Owners bring in their violins, violas, and cellos to the repair shop every season for cleaning, inspecting joints, and gluing gaps. The work involves tools similar to wood­worker’s tools, such as carving knives, planes, and gouges. The violin repairer will often need to play the instrument to check its condition and tune it. Bow rehairers maintain the quality of the taut, vibrating horsehair string that is stretched from end to end of the resilient wooden bow. Wind-instrument repairers require a similar level of skill to that required of stringed-instrument repairers. However, as the quality of sound is more standard among manufacturers, old instruments do not necessarily play any better than new ones, and these instruments do not command the same value as a fine violin. The repairer first needs to determine the extent of repairs that the instrument warrants. The process may range from a few minor repairs to bring the instrument up to playing condition to a complete overhaul. After fix­ing the instrument, the repairer also will clean both the inside and outside and may replate the metal finish on a scuffed or rusty instrument. For woodwinds such as clarinets and oboes, common repairs include fixing or replacing the moving parts of the instrument, including replacing broken keys with new keys, cutting new padding or corks to replace worn pieces, and replacing springs. If the body of the wood­wind is cracked in any sections the repairer will take the instrument apart and attempt to pin or glue the crack shut. In some situations, the repairer will replace the entire section or joint of the instrument. Repairing brass instruments such as trumpets and French horns requires skill in metal working and plat­ing. The pieces of these instruments are held together by solder, which the repairer must heat and remove to take the instrument apart for repair work. To fix dents, the repairer will unsolder the piece and work the dent out with hammers and more delicate tools and seal splits in the metal with solder as well. A final buffing and polish­ing usually removes any evidence of the repair. If one of the valves of the brass instrument is leak­ing, the repairer may replate it and build up layers of metal to fill the gaps. At times, the repairer will replace a badly damaged valve with a new valve from the instru­ment manufacturer, but often the owner will discard the entire instrument because the cost of making a new valve from raw materials is prohibitive. Replacement parts are usually available from the manufacturer, but parts for older instruments are sometimes difficult or impossible to find. For this reason, many repairers save and stockpile discarded instruments for their parts. In all their work, from tuning to rebuilding, piano tech­nicians discover a piano’s problems by talking to the owner and playing the instrument themselves. They may dis­mantle a piano partially on-site to determine the amount of wear to its parts and look for broken parts. They use common hand tools such as hammers, screwdrivers, and pliers. To repair and rebuild pianos, they use a variety of specialized tools for stringing and setting pins. For pipe organ technicians, the largest part of the job is repairing and maintaining existing organs. This primar­ily involves tuning the pipes, which can be time consum­ing, even in a moderate-sized organ. To tune a flue pipe, the technician moves a slide that increases or decreases the length of the speaking (note-producing) part of the pipe, varying its pitch. The tech­nician tunes a reed pipe varying the length of the brass reed inside the pipe. To tune an organ, the technician tunes either the A or C pipes by matching their notes with those of a tuning fork or electronic note-producing device. He or she then tunes the other pipes in harmony with the A or C notes. This may require a day or more for a moderate-sized organ and much longer for a giant concert organ. Pipe organ technicians also diagnose, locate, and cor­rect problems in the operating parts of the organ and perform preventive maintenance on a regular basis. To do this, they work with electric wind-generating equip­ment and with slides, valves, keys, air channels, and other equipment that enables the organist to produce the desired music. Occasionally, a new organ is installed in a new or exist­ing structure. Manufacturers design and install the largest organs. Each is unique, and the designer carefully super­vises its construction and installation. Often, designers individually create moderate-sized organs specifically for the structure, usually churches, in which they will be played. Technicians follow the designer’s blueprints closely during installation. The work involves assembling and connecting premanufactured components, using a variety of hand and power tools. Technicians may work in teams, especially when installing the largest pipes of the organ. Although the electronic organ imitates the sound of the pipe organ, the workings of the two instruments have little in common. The electronic organ consists of electri­cal and electronic components and circuits that channel electrical current through various oscillators and ampli­fiers to produce sound when a player presses each key. It is rare for an oscillator or other component to need adjustment in the way an organ pipe needs to be adjusted to tune it. A technician tunes an electronic organ by test­ing it for electronic malfunction and replacing or repair­ing the component, circuit board, or wire. The work of the electronic organ technician is closer to that of the television repair technician than it is to that of the pipe organ technician. The technician often begins looking for the source of a problem by checking for loose wires and solder connections. After making routine checks, technicians consult wiring diagrams that enable them to trace and test the circuits of the entire instru­ment to find malfunctions. For instance, an unusual or irregular voltage in a circuit may indicate a problem. Once the problem has been located, the technician often solves it by replacing a malfunctioning part, such as a circuit board. Other types of repairers work on a variety of less com­mon instruments. Percussion tuners and repairers work on drums, bells, congas, timbales, cymbals, and castanets. They may stretch new skins over the instrument, replace broken or missing parts, or seal cracks in the wood. Accordion tuners and repairers work on free-reed por­table accordions, piano accordions, concertinas, harmo­niums, and harmonicas. They repair leaks in the bellows of an instrument, replace broken or damaged reeds, and perform various maintenance tasks. Other specialists in instrument repair include fretted-instrument repairers, harp regulators, trombone-slide assemblers, metal-reed tuners, tone regulators, and chip tuners. Some musical repairers work as musical instrument designers and builders. 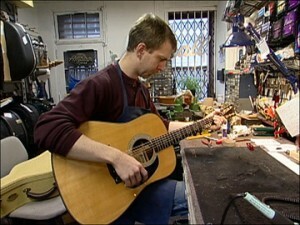 They work in musical instru­ment factories or as freelancers designing and building instruments in their own workshops. Almost any type of instrument can be designed and built, but musical instrument builders most often craft guitars, banjos, vio­lins, and flutes. In addition to repairing, designing, or building instru­ments, those who run their own shops perform duties similar to others in the retail business. They order stock from instrument manufacturers, wait on customers, handle their accounting and billing work, and perform other duties. No matter what family of instruments interests you, you should start preparing for this field by gaining a basic knowledge of music. Take high school classes in music history, music theory, and choir, chorus, or other sing­ing classes. By learning to read music, developing an ear for scales, and understanding tones and pitches, you will be developing an excellent background for this work. Also, explore your interest in instruments (besides your own voice) by taking band or orchestra classes or private music lessons. By learning how to play an instrument, you will also learn how a properly tuned and maintained instrument should sound. If you find yourself interested in instruments with metal parts, consider taking art or shop classes that provide the opportunity to do metal working. These classes will allow you to practice solder­ing and work with appropriate tools. If you are interested in piano or stringed instruments, consider taking art or shop classes that offer woodworking. In these classes you will learn finishing techniques and use tools that you may relate to the building and maintaining of the bodies of these instruments. Because instrument repair of any type is precision work, you will benefit from taking mathematics classes such as algebra and geometry. Since many instrument repairers and tuners are self-employed, take business or accounting classes to prepare for this possibility. Finally, take English classes to develop your research, reading, and communication skills. You will often need to con­sult technical instruction manuals for repair and main­tenance work. You will also need strong communication skills that will help you broaden your client base as well as help you explain to your clients what work needs to be done. There are two main routes to becoming a music instru­ment repairer and tuner: extensive apprenticeship or for­mal education through technical or vocational schools. Apprenticeships, however, can be difficult to find. You will simply need to contact instrument repair shops and request a position as a trainee. Once you have found a position, the training period may last from two to five years. You will get hands-on experience working with the instruments as well as having other duties around the shop, such as selling any products offered. Depending on the family of instruments you want to work with, there are a number of technical or vocational schools that offer either courses or full-time programs in repair and maintenance work. Professional organi­zations may have information on such schools. The National Association of Professional Band Instrument Repair Technicians, for example, provides a listing of schools offering programs in band instrument repair. The Piano Technicians Guild has information on both full-time programs and correspondence courses. Wind instrument repairers can learn their craft at one of the handful of vocational schools in the country that offers classes in instrument repair. Entrance requirements vary among schools, but all require at least a high school diploma or GED. Typical classes that are part of any type of instrument repair and tuning education include acoustics, tool care and operation, and small business practices. Depending on what instrument you choose to specialize in, you may also study topics such as buffing, dent removal, plating, soldering, or woodworking. You may also be required to invest in personal hand tools and supplies, and you may need to make tools that are not available from suppliers. If you are interested in working with electronic organs, you will need at least one year of electronics technical training to learn organ repair skills. Electronics train­ing is available from community colleges and technical and vocational schools. The U.S. Armed Forces also offer excellent training in electronics, which you can apply to instrument work. Electronic organ technicians also may attend training courses offered by electronic organ manufacturers. A number of instrument repairers and tuners have completed some college work or have a bachelor’s degree. Although no colleges award bachelor’s degrees in instru­ment repair, people who major in some type of music performance may find this background adds to their understanding of the work. The Piano Technicians Guild helps its members improve their skills and keep up with developments in piano tech­nology. Refresher courses and seminars in new develop­ments are offered by local chapters, and courses offered by manufacturers are publicized in Guild publications. The Guild also administers a series of tests that can lead to certification as a registered piano technician. Personal qualifications for people in this occupational group include keen hearing and eyesight, mechanical aptitude, and manual dexterity. You should be resource­ful and able to learn on the job, because every instrument that needs repair is unique and requires individual care. You must also have the desire to learn throughout your professional life by studying trade magazines and manu­facturers’ service manuals related to new developments in their field. You can also improve your skills in training programs and at regional and national seminars. Instrument manufacturers often offer training in the repair of their particular products. Other qualifications for this career relate to your instrument specialty. For example, if you want to work as a piano technician, you should be able to communi­cate clearly when talking about a piano’s problems and when advising a customer. A pleasant manner and good appearance are important to instill confidence. While the physical strength required for moving a piano is not often needed, you may be required to bend or stand in awkward positions while working on the piano. If you are interested in working as a pipe organ technician, you will need the ability to follow blueprints and printed instructions to plan and execute repair or installation work. And any repairer and tuner who works in a store selling musical instruments should be comfortable work­ing with the public. One of the best ways to explore this field is to take some type of musical instrument lessons. This experience will help you develop an ear for tonal quality and acquaint you with the care of your instrument. It will also put you in contact with those who work professionally with music. You may develop a contact with someone at the store where you have purchased or rented your instrument, and, naturally, you will get to know your music teacher. Ask these people what they know about the repair and tuning business. Your high school or local college music departments can also be excellent places for meeting those who work with instruments. Ask teachers in these depart­ments whom they know working in instrument repair. You may be able to set up an informational interview with a repairer and tuner you find through these contacts. Ask the repairer about his or her education, how he or she got interested in the work, what he or she would recommend for someone considering the field, and any other questions you may have. Part-time and summer jobs that are related closely to this occupation may be difficult to obtain because full-time trainees usually handle the routine tasks of a helper. Never­theless, it is worth applying for such work at music stores and repair shops in case they do not use full-time trainees. General clerical jobs in stores that sell musical instruments may help familiarize you with the language of the field and may offer you the opportunity to observe skilled repairers at work. Approximately 6,000 people work as musical instrument repairers and tuners of all types in the United States. About one in six are self-employed and may operate out of their own homes. The majority of the rest work in repair shops and music stores and for manufacturers. Large cities with extensive professional music activity, both in the United States and in Europe, are the best places for employment. Musical centers such as Chicago, New York, London, and Vienna are the hubs of the repair business for stringed instruments, and any repairer who wishes a sufficient amount of work may have to relocate to one of these cities. Some piano technicians work in factories where pia­nos are made. They may assemble and adjust pianos or inspect the finished instruments. Some technicians work in shops that rebuild pianos. Many piano repairers and tuners work in customers’ homes. Most of the few hundred pipe organ technicians in the United States are self-employed. These pipe organ tech­nicians are primarily engaged in repairing and tuning existing organs. A small number are employed by organ manufacturers and are engaged in testing and installing new instruments. The great expense involved in manu­facturing and installing a completely new pipe organ decreases demand and makes this type of work scarce. Vocational schools and community colleges that offer instrument repair training can usually connect recent grad­uates with repair shops that have job openings. Those who enter the field through apprenticeships work at the local shop where they are receiving their training. Professional organizations may also have information on job openings. Repairers and tuners may advance their skills by partici­pating in special training programs. A few who work for large dealers or repair shops may move into supervisory positions. Some instrument repair technicians become instructors in music instrument repair programs at com­munity colleges and technical institutes. Another path to advancement is to open one’s own musical repair shop and service. Before doing this, how­ever, the worker should have adequate training to survive the strong competition that exists in the tuning and repair business. In many cases, repairers may need to continue working for another employer until they develop a clien­tele large enough to support a full-time business. A few restorers of stringed instruments earn world­wide reputations for their exceptional skill. Their earnings and the caliber of their customers both rise sig­nificantly when they become well known. It takes a great deal of hard work and talent to achieve such professional standing, however, and this recognition only comes after years in the field. At any one time, there may be perhaps 10 restorers in the world who perform exceptional work, while another 100 or so are known for doing very good work. The work of these few craftspeople is always in great demand. Wages vary depending on geographic area and the work­er’s specialty, skill, and speed at making repairs. Full-time instrument repairers and tuners had a median income of $28,530 in 2004, according to the U.S. Bureau of Labor Statistics. The highest paid 10 percent earned $51,940 or more per year, and the lowest paid earned less than $17,050 annually. Some helpers work for the training they get and receive no pay. Repairers and tuners who are self-employed earn more than those who work for music stores or instrument manufacturers, but their income is generally less stable. Repairers who gain an international reputation for the quality of their work earn the highest income in this field. Repairers and tuners working as employees of manu­facturers or stores often receive some benefits, including health insurance, vacation days, and holiday and sick pay. Self-employed repairers and tuners must provide these for themselves. Repairers and tuners work in shops, homes, and instru­ment factories, surrounded by the tools and materials of their trade. The atmosphere is somewhat quiet but the pace is often busy. Since repairers and tuners are usually paid by the piece, they have to concentrate and work dili­gently on their repairs. Piano technicians and tuners gen­erally perform their work in homes, schools, churches, and other places where pianos are located. Instrument tuners and repairers may work more than 40 hours a week, especially during the fall and winter, when people spend more time indoors playing musical instruments. Self-employed tuners and repairers often work evenings and weekends, when it is more convenient to meet with customers. As noted, many repairs demand extreme care and often long periods of time to complete. For large instru­ments, such as pianos and pipe organs, repairers and tuners may have to work in cramped locations for some length of time, bending, stretching, and using tools that require physical strength to handle. Tuning pianos and organs often requires many hours and can be tedious work. The field at times may be very competitive, espe­cially among the more prestigious repair shops for stringed instruments. Most people at the major repair shops know each other and vie for the same busi­ness. There is often a great deal of pressure from own­ers to fix their instruments as soon as possible, but a conscientious repairer cannot be rushed into doing a mediocre job. In spite of these drawbacks, repair work is almost always interesting, challenging, and reward­ing. Repairers never do the same job twice, and each instrument comes with its own set of challenges. The work requires repairers to call on their ingenuity, skill, and personal pride every day. Job opportunities for musical instrument repairers and tuners are expected to grow more slowly than the aver­age through 2014, according to the U.S. Department of Labor. This is a small, specialized field, and replacement needs will be the source of most jobs. Because training positions and school programs are relatively difficult to find, those with thorough training and education will have the best employment outlook. It is a luxury for most owners to have their instru­ments tuned and repaired, and they tend to postpone these services when money is scarce. Tuners and repair­ers therefore may lose income during economic down­turns. In addition, few trainees are hired at repair shops or music stores when business is slow.